Begin at START, test each repair issue, and narrow the problem down to a numbered solution. 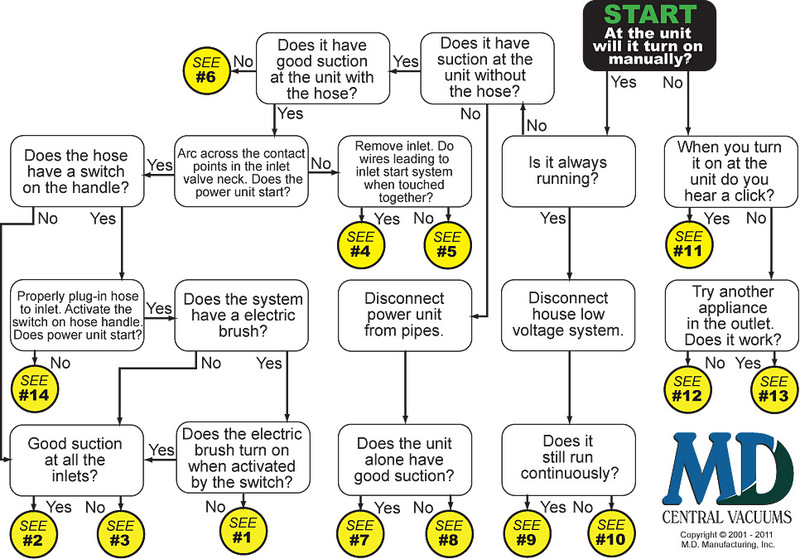 You can also print a PDF Troubleshooting Repair Chart & Solutions. Click the circle to take you directly to the repair options on this page below the chart. Also use the topics to the right, where many questions have additional information. If can't find the help you need, please email a troubleshooting central vacuum question or call the number at the top or bottom of this page. Central vacuum troubleshooting repair can be done by a homeowner or a qualified dealer. Many times, dealers will be able to pick up on things others may miss, simply because they are involved with these vacuums on a regular basis. Since central vacuum troubleshooting is virtually standard across all brands, you can choose the most capable dealer in your area to help guarantee great service. #1 - Electrical failure or short in vacuum head or hose. Validate the wall inlet valve has 110 volts (two pin hole connection types), or the regular electrical wall socket has voltage (pigtail corded hose types). When there is intermittent power there may be a short. Check cord connections from hose to brush. With the vacuum head spinning carefully manipulate each connection point individually including the hose entering the handle. Check power brush reset button and on some vacs the neck tilt switch by listening for it to pop out just before the neck goes into the upright position (may be jammed with lint). Open vacuum head and put power directly to motor. If it runs for 10 minutes it is okay. If not then replace vacuum head (motors cost nearly just as much) or replace hose, head, and accessories with a brand new Complete Attachment Kit (compatible with all vacuum systems) or a new vacuum head (if compatible with your hose and connection wands). #2 - Clog, not located in system pipes. Check power brush head for a clog by turning it over. Remove wand tube to see inside vacuum neck for possible clog. Check wand tubes by removing them and looking through them. Check hose for clog by plugging it into a properly flowing wall inlet valve and disconnecting it from any accessory or wand. If no suction present through the handle then remove the clog using a long stiff object, such as a butter knife, through the hose starting at the wall end or push a garden hose through vac hose. Don't turn water on! Or remove the clog by reversing the air flow through the hose by connecting it to the intake on the main unit or pressing the handle end into wall valve using tin foil lump to activate the connection. #3 - Clog located in central vacuum system pipes or tubes. NOTE: Proper installation of a central vacuum virtually guarantees no clogging. Any long stiff object will get stuck at the first elbow just behind the wall valve which is designed to catch items. Otherwise, a sloppy installation can catch an object which will catch debris over time. Many times the build up will cause it to break way but in the rare instance that the clog continues, here are the best ways to repair the vacuum clog. Isolate exactly where clog is - by determining the inlet furthest from the vacuum unit that is not suctioning well. The clog is between that inlet and the unit and is the one you will be working on. You can also find the clog by running a numbered Styrofoam ball through each inlet. Find which balls made it to the power unit. Put hose into wall inlet as usual, hold hand over other end and let the pressure build up. Quickly release hand and let air rush in. Try this multiple times from various inlets, even ones that are close but work properly. The build up pressure and release creates rhythm and movement in the pipes and many times repairs the clog in the central vacuum system pipe. To allow more pressure and air flow use a hose end alone. Check the space immediately behind wall inlet, and the connection right at the vacuum collection tank by pulling it off (it should not be glued on). It is not uncommon for a clog to found right there. Run a Free Flow Maintenance Sheet through the clogged inlet valve. It has a good change of suffocating the clog and allowing the pressure to build up so it can all be pushed through. Try pulling the clog backwards through the pipe and inlet valve. Use a portable vacuum or shop vac directly into the wall valve. Let pressure build then release, do this multiple times. Be sure to allow air to flow backwards - remove the central vacuum unit's bucket or top to expose the filtration. Instead of a portable vacuum, the central vacuum tank itself may be used. Remove from wall, set next to wall inlet, plug it into electrical, connect hose to tank port or tank intake, and put hose handle end into wall inlet and seal with hand. Run electrician's fish-tape or plumber's snake, through pipe and try to hook object/clog. Use less sturdy types as the central vacuum pipe is only 1/16" thick PVC. Any recent construction or workers who might have driven a nail into a pipe (esp. closet organizers, phones, or alarms)? If the clog will not come out then locate its exact location by one of several ways. A) Run paper towel through and listen for humming or vibration. B) Create louder noise using a ping-pong ball. Insert in inlet and turn on unit (remove inlet to get ball in). Hopefully the area is easily accessible. Cut the pipe and pull out the clog. Use a coupling to easily put the pipe back together. *Very important: Once the clog is removed, check to be sure by running a Free Flow Maintenance Sheet through each inlet. If they don't all show up do it again with numbers on each to determine which valve is clogged. Pipes that run underground can sometimes coagulate with debris from moisture. Proper installation is running central vac pipe inside three inch irrigation pipe. Run 10 pounds of rice through system into unit, repeat. If not effective, trench old lines and replace. The low voltage connection is no longer reaching the contacts that touch the hose when inserted. This can be for a variety of reasons depending in the inlet valve. Inlet valve parts are not available. Thankfully 99% of inlet valves are the same type across all brands everywhere. Buy Replacement Inlet Valves. Inlet valves that do not match the variety in the link above may or may not be available or replaceable. Find your brand and look at the inlet valve section, or give us or a dealer a call for help. 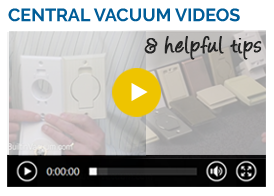 Watch the Inlet Valve Installation Video for tips and help. #5 - Low voltage wire cut or junction pulled apart. Recent construction done? Tripped over wire in attic? Any rats? Detached garage with main unit and line run underground? Recent digging? If you find the break, re-splice broken wire (coppers together and tins together). Wires could be disconnected at the main unit. Here is no polarity so wires can go back into either connection. Can't find the break? Options are to A) re-route wire from any working inlet or power unit to the section of wire or the unfuctioning inlet. Try to tie new wire to existing bad wire and pull it through. Buy Central Vacuum Wire. B) Add a remote control clicker and receiver to the system. It's easy and convenient. #6 - Clog in the main unit filter screen or there is a clog in the hose. For bagless, bottom-emptying central vacuums, be sure to reach up into the vacuum unit to find a filter or screen that needs to be cleaned, replaced, or scraped off. #7 Unit is good, pipes have leaks. Recent work done on house? Recent wallpapering or paneling? Inlet removed or re-installed incorrectly? Inlets installed in floor; pipe fell down or loose? Turn unit on and walk around house listening for a leak. Inlet roughed in but not found on finish? Pipe running underground has a break in it. Recent gardening or tree roots strangling it. #8 - The Power unit has bad suction. If multi-motored unit: are both working? Check power unit gaskets and cracks in housing. Improper voltage into power unit. Lint & debris in motor fan blades. Lint & debris on screen on intake. Too much back pressure from exhaust line. On bag type unit: Excessive amount of very fine plaster dust clogging primary or secondary filter. #9 - Short in power unit. Directly isolate low voltage leads alone (disconnect all auxiliary switches). Short in relay. *Very rare. #10 - Short in low voltage system. Recent attic work or someone in crawl space? Disconnect any splices you can find & check continuity of short. #11 - Relay getting power but the vacuum motor is not turning on. Dead motor. 99% of the time, the motor is bad and needs to be replaced. See your Brand Motor Chart for replacement motor and instructions. If there is a mini-breaker popped out over an inch, push it in and try the motor again. It may work for a few minutes but shut off again. This is proof the motor is bad. Slapping the canister may get it to start again too. Motors last from 800-1100 hours, if your motor is not that old, try replacing the carbon "motor brushes". More information on testing motor, relay, transformer, motor brushes, circuit board. #12 - The power unit is not getting electricity. Try vacuum in another outlet. 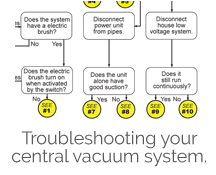 Is the circuit breaker the right size for the power unit? See what is on the circuit: is it overloaded? Continually re-check the system after you do get power to see if it was the vac that tripped the circuit. If necessary, have an electrician look at it. How to test motor, relay, transformer, brushes, circuit board. #13 - Transformer and motor not getting power. Bad transformer- check for spark between 2 low-voltage wires out of transformer. Bad relay- check points, arc across to see if it solves it. #14 - Low voltage in hose is not working. If switch feels "mushy" then it needs to be replaced. Remove hose from wall and take apart the handle end. Look for lint or other debris in contact points. Make sure hose is being fully inserted into inlet. Hose may need to be replaced.